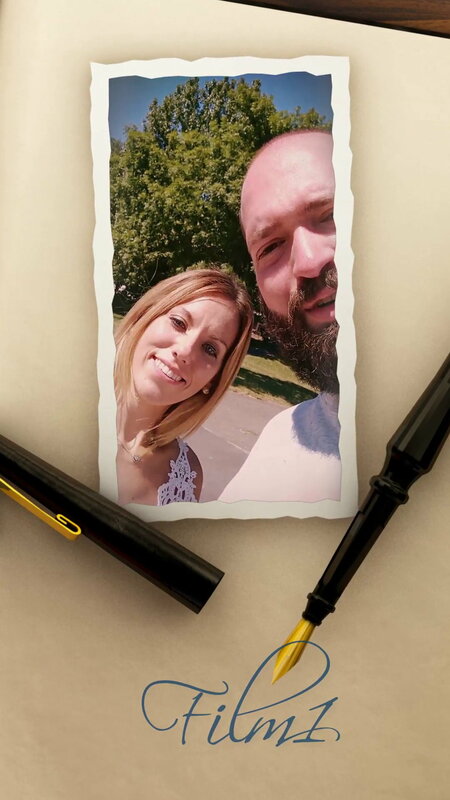 How can I send my exported vertical video back to my smartphone easily? This works fast and easily via ‘Nero MediaHome WiFi Sync App’. Within your vertical project in Nero Video select the export function. Select the option ‘Add to Nero MediaHome Library’ in the export screen for your vertical video. When the export is finished open Nero MediaHome and you will see your vertical video listed (more on that further down). Install the free App ‘Nero MediaHome WiFi Sync’ via Google Play (Android) or App Store (iOS) on your smartphone or tablet. Make sure Nero MediaHome and Nero MediaHome WiFi Sync are logged in to the same network. Make suere Nero MediaHome on your PC is running. While connected to the same network open Nero MediaHome WiFi Sync on your mobile device and switch it on. 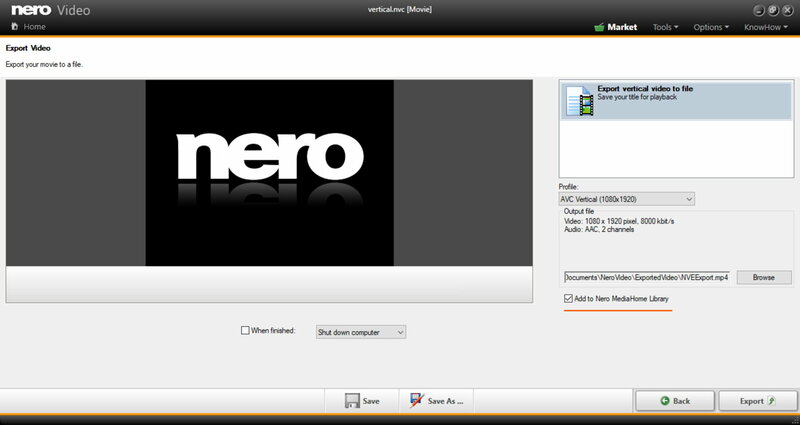 Nero MediaHome WiFi Sync will show your instance of Nero MediaHome. Click on it to activate the connection. Nero MediaHome on your PC will now show your mobile device in the device view top left. Select your prior exported vertical video in Nero MediaHome and drag it to your mobile device top left, as shown here. The transmission will start right away. The status can be checked bottom left. Now, on your mobile device open your preferred video player and play your vertical video. If you are utilizing the free App ‘Nero Streaming Player’ (Android/iOS) you will be able to watch your vertical video on your device or directly play it on Smart TV in the living room. The description and procedures as laid out here adequately work for sending wide screen video to your smartphone and for streaming it to your TV. What can I do with Nero MediaHome WiFi Sync? Goodbye to your cables and plugs! ‘Nero MediaHome WiFi Sync’ App is the super easy to use wireless solution for transferring your image, video, and music files from your mobile device to your PC and vice versa. ‘Nero MediaHome WiFi Sync’ helps you to sync all your media in just a few simple steps between your PC and your iOS or Android device. Pre-condition: Install and run the universal media center ‘Nero MediaHome’ on your PC, and have your PC and your mobile device logged in to the same network. How can I archive content on my smartphone wirelessly on my PC and vice versa? I bet you know this situation: you have lots of photo and video stuff on your smartphone that you want to archive on your PC. At the same time you have some favorite videos and fine tuned photos on your PC that you want to have on your smartphone to take with you. Thanks to ‘Nero MediaHome WiFi Sync’ in combination with ‘Nero MediaHome’ on your PC there is an easy, wireless, fast and reliable solution providing all you ever wanted. 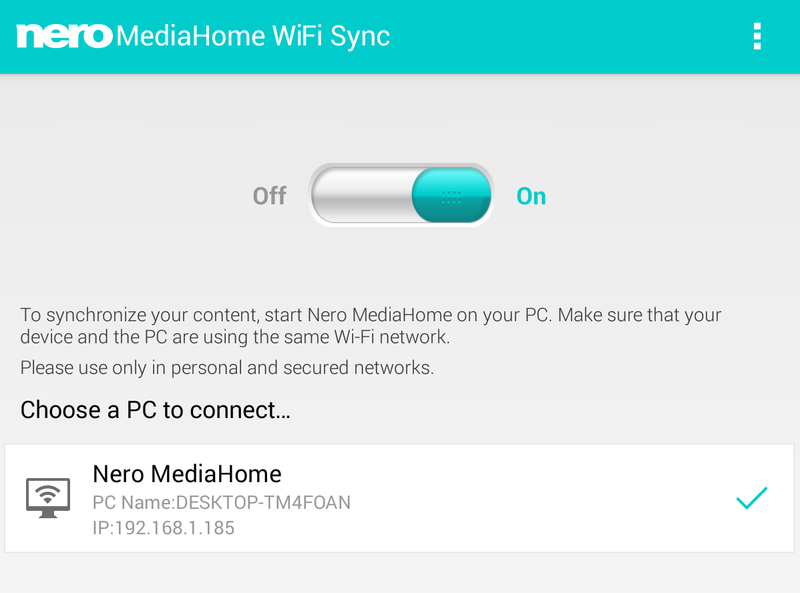 ‘Nero MediaHome WiFi Sync’ works both ways: it wirelessly archives media files located on your mobile device to your PC, and it sends selected media files from your PC to the mobile device. Comfortable auto-conversion included, if needed. Make sure your mobile device and your PC are logged in to the same network. Open ‘Nero MediaHome’ on your PC. Switch on ‘Nero MediaHome WiFi Sync’. ‘Nero MediaHome’ on your PC will be auto-detected within the app and you are ready to start. In case you have more than one PC with ‘NeroMediaHome’ running in your network select the suitable one. ‘Nero MediaHome’ on your PC shows your mobile device in the device list top left. Click on your device, select photos and videos, and press ‘import’. For transferring photos and videos from ‘Nero MediaHome’ to your mobile device, select files in ‘timeline’ view, ‘faces’ or ‘places’ view. 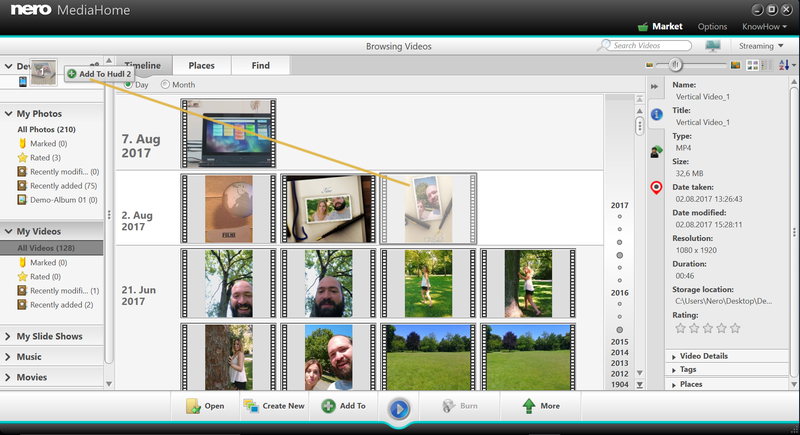 Then drag and drop your photos and videos to your mobile device in the device list. Transferring will start immediately. Install the iOS and Android app for free via the respective app store. Works in combination with Nero MediaHome 2017, Nero 2017 Platinum, Nero 2017 Classic, Nero Video 2017.